By buying this product you can collect up to 185 loyalty points. Your cart will total 185 points that can be converted into a voucher of RM1.85. Ant-Man has made a stunning and heroic entrance to Marvel Cinematic Universe in movie Ant-Man, and he is returning with his partner, Wasp to hit the big screen in this summer. 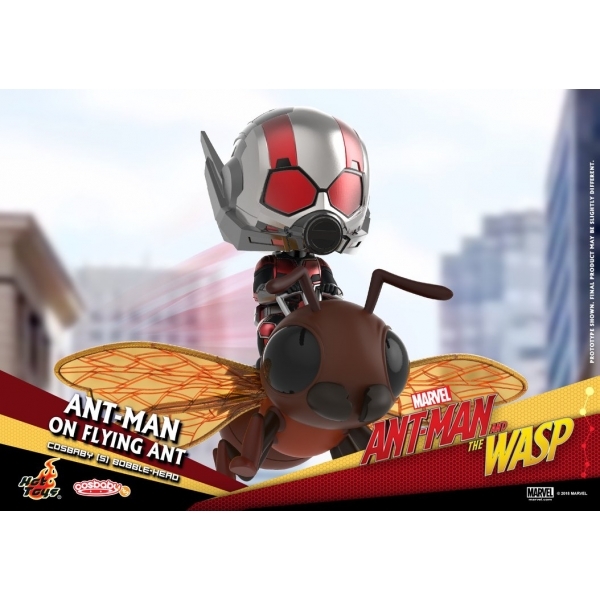 In anticipation of the film’s release, Hot Toys is pleased to introduce to fans the Ant-Man and the Wasp Cosbaby (S) Bobble – Head series which includes Ant-Man, Wasp, Ant-Man on Flying Ant and Movbi, the Hot Toys’ original character. Each of these Cosbabies comes with Bobble-Head feature and stands approximately 9.6 – 12cm tall. 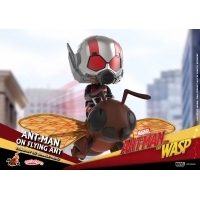 Two brand new collectible sets are available featuring Ant-Man and the Wasp respectively. 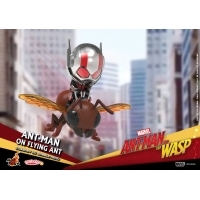 The first set includes Ant-Man standing in his red and silver battle suit with two special translucent red-colored miniature Ant-Man in different sizes (standing at approximately 2cm and 4cm) inspired by his special ability. 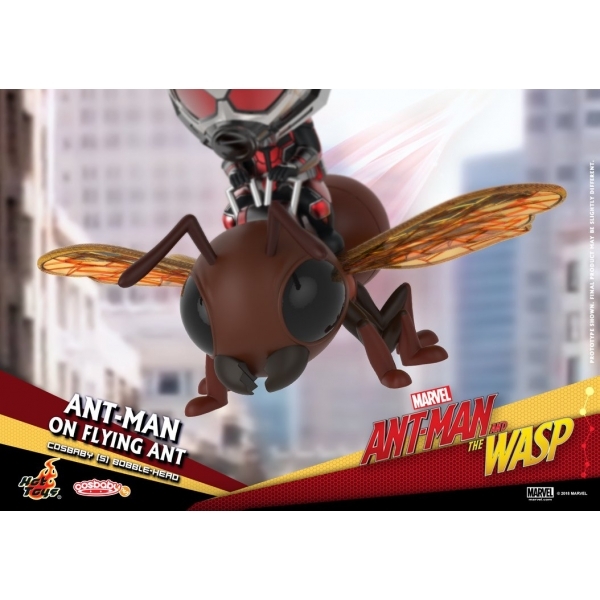 The second set includes the newly debuted flying Wasp in her blue and gold suit with two miniatures in translucent yellow-colored suit (standing at approximately 2cm and 4cm). Fans will be excited to meet another exclusive set with Ant-Man on Flying Ant. The microscopic super hero rides on his trusty steed, the giant winged companion and together they are heading to the dangerous battlefield for their final destination! Last but not least, Hot Toys’ original character, Movbi wears a pair of honeycomb shaped glasses with a hotdog will come together in a special box set that features Ant-Man Cosbaby Bobble-head with a shiny metallic colored helmet. 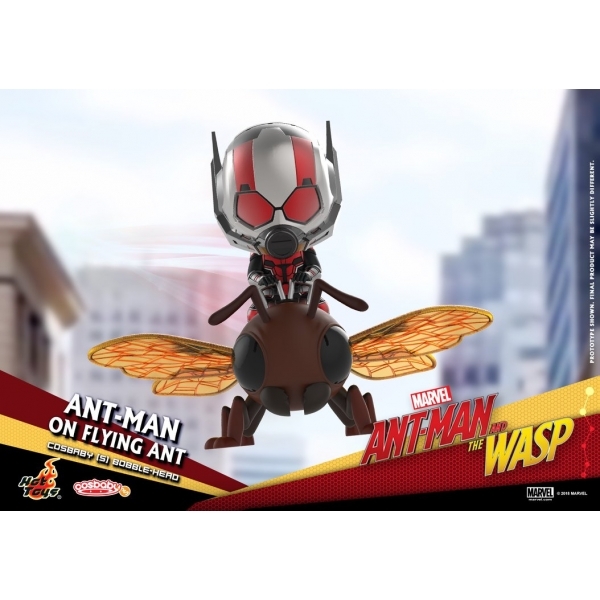 Pick up the insect-sized heroes from Hot Toys and place it along with your incredible Marvel Cosbaby collection!